Morecambe Bay Partnership is a charity that brings funding to the Morecambe Bay area. The Partnership’s charitable work benefits the communities, heritage and environment around the Bay. Morecambe Bay Partnership’s most notable project is the Bay Cycle Way. Launched in 2015, the cycle way has opened up the Bay to new visitors and won at both Lancashire (2015) and Cumbria (2017) Tourism Awards, as well as being a finalist in the National Tourism awards (2016) for Visitor Experience. 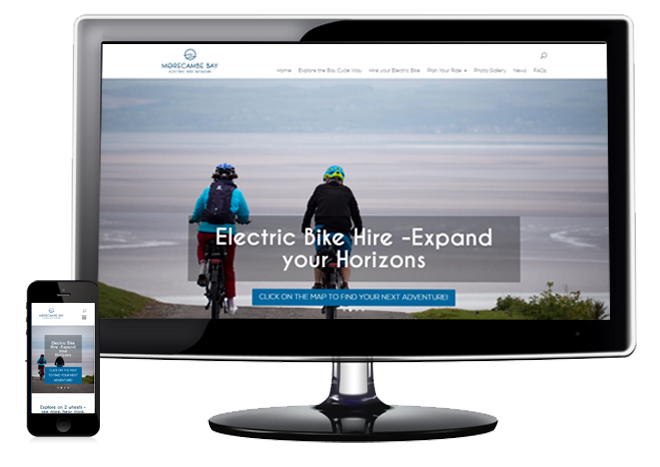 We designed and developed a WordPress website to promote an electric bike network of hire and charge points. The network is in the Morecambe Bay area and in close proximity to the Bay Cycle Way. The website uses Google Maps to display the Bay Cycle Way route and pinpoint the hire/charge locations. Each pinpoint features a pop-up window with further information and contact form. We’ve developed the site so the pinpoints are easily editable by the client as they expect to have more hire and charge points join the network.